We designed these special for Valentine's Day! But, of course, would be useful any day of the year. They are decorated with art and lined on both the front and back sides. Cards are 4"x6". 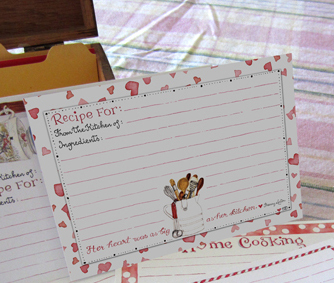 Package includes 25 recipe cards. Quote on bottom of card says, "Her heart was as big as her Kitchen. Franny Lester".